A taste of the Big Apple in Shanghai. : The name Pelham's pays tribute to Sir Warren Pelham, who in 1910 founded the Shanghai Club where the Waldorf Astoria Shanghai on the Bund now stands. 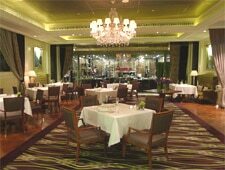 The restaurant, located on the lobby level of the Waldorf Astoria Club, features an elegant main dining room and a contemporary, glass-enclosed exhibition kitchen. Beyond the glassed-in columns of the wine cellar lies a semi-private dining room with more than a thousand American pennies adorning the ceiling. The menu features French-influenced modern American fare. We recommend starting with the duo of foie gras (both pan-fried and terrine) with passion fruit, orange, almonds and lychee. Follow that with Australian Wagyu rib-eye steak or the Alaskan king crab. For dessert, you might encounter a hot chocolate pudding consisting of baked pudding with gingerbread chocolate sorbet and orange vanilla sauce. There is also a seven-course dégustation menu available. The cuisine may have its roots in the Big Apple, but the menu and wine list still respect Chinese tradition with all prices ending with the lucky number eight.